We normally write posts in English but as this contest happened in Spain and the winners were Spaniards (duh!) we’ll write it in Spanish. 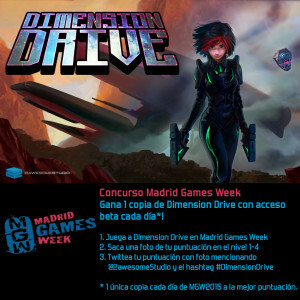 If you are interested in knowing what went down (tl,dr version): we did a contest each day of the Madrid Games Week, the highest score of the day got a free copy of Dimension Drive with early access. Last but not least important, we will release a new alpha build after #MGW2015. Since our last public alpha (after Gamescom) we have been working really hard to add more content, fix some bugs and add some suggestions you have sent us (we are taking note of all your feedback and requests, but some of them we still didn’t have time to implement them) Please note that this new public alpha will be the last one we will be releasing public before going to close alpha in Steam. As soon as we have everything ready in Steam we will send your keys (to all backers with early access). We have decided to move already to steam in order to make all the update process more transparent for everyone (more on that once we are in Steam). In case you are a backer with early access but you prefer not to use Steam, please let us know. Well,I think my plane is going to be landing soon, so this is all for now. Hope to see some of you these days in Madrid Games Week, otherwise we hope you will like the new alpha build (will be available in Game jolt probably sometime next week). Indie Gameleon, Humble and Lasers! We know, we know… we promised to keep the update rate low but we got some news that couldn’t wait one more week. So, this is going to be a short update. David ( @dajimba ) has been invited to give a talk next week at the Indie Gameleon festival that will take place from the 11th to the 15th of September in Hamburg. His talk will go over all the details of our 60 days in Kickstarter and he’ll also show the latest build of Dimension Drive obviously. If you happen to be there or know somebody that may be there let us know, would be cool to meet and talk about all things Dimensional! We have also another big important announcement. Some people asked us when we were running the Kickstarter to accept Paypal but we couldn’t at that time. Now, thanks to the fantastic people at Humble Bundle we have now open pre-orders via the Humble Widget. Help us spread the word, if somebody is interested in Dimension Drive they can now pre-order it directly here. So, how are things regarding the game development? They are going great, but we’ll leave that for a big update close to Tokyo Game Show. For the moment we leave you with a small bite of what’s coming. We hope you like… crazy lasers! Thanks a lot for the feedback you have given us on the last build (Alpha 651). In case you haven’t had the chance to play it, please check it out over here and let us know your thoughts. All of these changes are not yet playable but we are getting closer to a new alpha build that we want to show next 17th to 20th of September at Tokyo Game Show. Yeah, you read that right! Dimension Drive goes to Japan. We have been selected to showcase at the Holland Pavilion this September at Tokyo Game Show. OuuuYeah !!!!! @aeonphyxius (Alejandro) will travel all the way to Japan and will show everyone there the new build. We hope to get tons of feedback from the Shoot’em ups country … and of course have lots of fun, because game development is not only about working hard :). Last week we were at Gamescom, we have sent the Roche Fusion keys and we are working towards finishing World 1. But before going into any of that, we bring you a new Alpha buildthat we want you to try, play, break and test as much as you can! We will be extra grateful if you could send us some feedback about it. Feel free to use the comments here, email, Twitter orFacebook, we check everything. As usual you can download it in Gamejolt. And for the first time we have a Linux build, wohoo! Let’s meet, come to Gamescom! Next week is Gamescom! And as we said in our previous update we are going to release a new build after it. We’ll correct any major issue that we identify during Gamescom and get you a cleaner build. If you happen to be in Gamescom and want to come meet us an have a sneak peak at this new alpha come meet us. One of the things we get when people play the game is that they like it but they miss that extra bit of cool. Going into that direction Max and Stan went back to the drawing board and kicked it up a nodge! This means that the backgrounds of Level 1-2 are brand new and they capture better the feeling of animated comic we want to achieve. Plus green is now the main color for this level in line with what we want for planet Vain. Hope you like the progress we are making on the game and we have a chance to meet you in person soon! Some of you may be wondering if you received or not the emails about the Kickstarter rewards. Our apologies, it’s taking us longer than we planned mainly because we have been focused on adding as much as we can to the build that will be showcased during Gamescom. We are still setting up the website that should make all the process of receiving your info automatic. Don’t worry, we are almost done. After Gamescom expect to hear from us. we have been a bit busy over the last few weeks after our Kickstarter campaign ended. Getting the final list of backers from the Kickstarter guys is not so quick (we just got it last Wednesday as they have to process all payments ). We also have been working in a development plan within all the team members, so we know more or less the road-map for the next months. 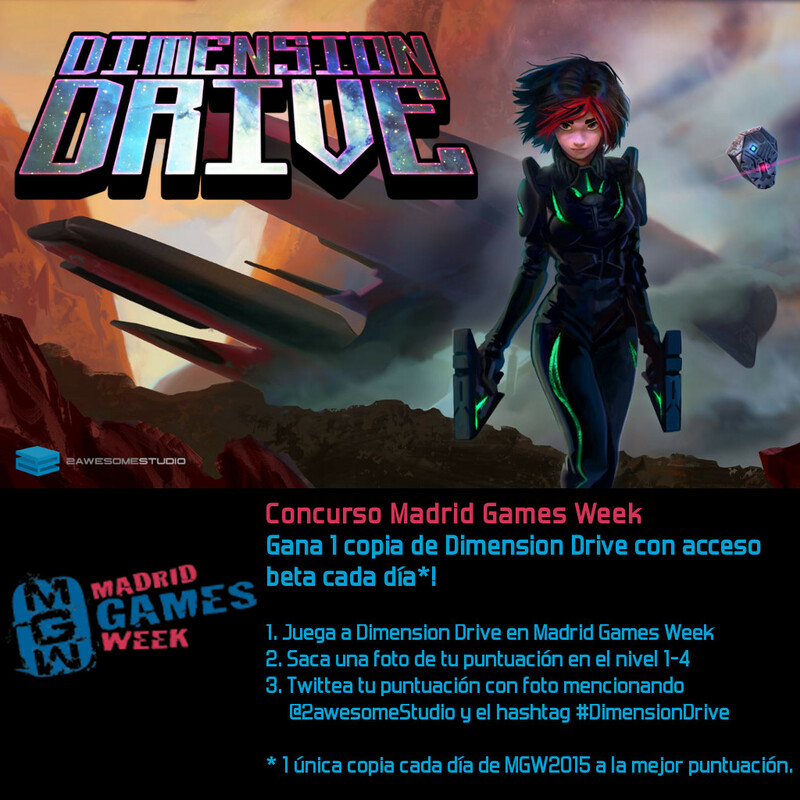 As soon as we have it finalized we would love to share with you, so you all are aware on our next steps, and when you will be able to play new versions of Dimension Drive :). For those of you with beta access, we are probably going to start releasing the closed alpha / beta builds after the Gamescom conference, next August. Our idea is to keep open alpha builds for everyone till then. After that we will go for a close “early” access method till launch date. We will keep you posted on how we will distribute it (and give you keys, if we decide to go with Steam early access for example). We are still sorting out things on this subject. Starting this week we will start sending out emails in order to get the information needed to provide you with your rewards :). We are trying to set up a small web site where you will be able to choose things like the name you want to appear in the credits, the address you want us to send the physical rewards (in case is needed) and … well everything in order to get you sorted out. – For those of you that got the RocheFusion deal, we will try to provide you with the steam keys as soon as possible (hopefully even before the website is online). We just released a new build (644) at Gamejolt . This is the one we used at the last Gamelab in Barcelona. It has a few changes, like the control system, now the inverse drive button is hold & release ( inverse – normal ). We also fixed some bugs, and improved a bit the graphical detail. Thank you. Wow. Just…thanks. We can’t express correctly how we feel right now. We had a dream, just a dream when everything started more than 4 years ago with Alejandro and David playing old shoot’em ups in a rainy weekend (we are in The Netherlands, so this happens a lot :P). It took us a while to come from a first prototype in XNA ( for Xbox Live Inde Games), to a funded Kickstater with a full team of designers, musicians, … an AWESOME team. At some point in between, we realized that we couldn’t continue on our own. Then we decided to share our dream with all of you, to ask for help, YOUR help. And you gave it to us, taking your own money away from anything else, to support our dream. But not only that, you reached out asking others to participate in this dream. And it’s finally happening. It might have been 1-2 months for you, but it has been some years for David and Alejandro. Our most sincere and deepest THANK YOU. We couldn’t have run 2 Kickstarter campaigns back to back without your help and support (specially after what happened at the end of the firs one). But finally now we can say (with no last minute surprises) …that we are funded, but not only that, we even reached some really nice stretch goals. The 2 player mode has us really excited !!! So, what’s next? We are going to get back to work right away (actually we never stopped). If you remember next week Alejandro will be showcasing at Gamelab in Barcelona. In August Alejandro and David will be at the Cologne GamesCon within the Holland Pavilion. If you’re going to be at any of those events, hit us up through twitter or e-mail so we can hang out! We know that 1194 of you are already super stoked for this game. But we want to continue spreading the word about Dimension Drive. Besides, the team hasn’t given up on PS4 (and other consoles) yet. There are ways to still make it happen. Stay tuned to find out how to help. We’ll be updating you on our usual channels (we promise to lower the amount of updates, some people mentioned that it was even too much 😛 ): Devlog, Kickstarter Updates, Twitter,Facebook, Youtube and Twitch. Please follow along and let’s stay in contact! One more time, thanks to you all! The INFINITE Stream! LAST 24 HOURS! We enter our last 24 hours in just a little while and we want to end this campaign going all sorts of crazy (the good sort of crazy though). Tomorrow we are going to do a special LIVE stream that will last more than 12 hours! Game art, coding, indie developer guests (Herald, Wildfire,Tic-Toc-Tower), shoot’em up party and many more! Tune in to our Twitch channel starting at 1 PM CET and finish this campaign on a high note, all together! Some of you asked about this, are you crossing over with Drifting Lands? YES! We are doing it again with the cool guys at Alkemi and their incredible Drifting Lands. Drifting Lands is an hybrid shmup / hack & slash currently in a free alpha stage available on Steam. In her multidimensional quest Jack will chase those pesky Ashajuls into the Drifting Lands planet! Drifting Lands takes place in the skies of a shattered planet. Centuries ago a huge cataclysm fragmented and froze this world in a state of partial disintegration. Powerful and mysterious gravitational anomalies keep the huge chunks of rock from drifting away in space or collapsing into a single body. And now Jack will have to manouver and teleport through all those huge and unstable chunks of rock while obliterating Ashajuls every Ashajul on her path! Wow, you did this! 2 player mode stretch goal unlocked! Thank you! So, what’s that you say? If we make a two player mode somebody has to pilot the second ship, right? Enter Jake, sounds familiar…because it is! Coming from a close dimension Jake is the alter ego Jack. He fights the Ashajuls piloting The Gryphon a similar ship to The Manticore. There you have it! Jack and Jake, Jake and Jack, The Manticore and The Gryphon. Double the fire power, double the fun! We are really close to enter our last day in Kickstarter and some suprises still await, keep spreading the word and let’s make this game for Playstation 4!